I don’t know about you but I absolutely believe that “it is impossible to spend too much time on place value” (Kuhns, Lasater, 2013, p. 63). One of my favorite activities for developing this critical concept is a treasure report. By having a collection of counters and an assortment of organizers, this is an activity which can be repeated as many times as needed throughout the year. It helps young learners to construct the understanding that a set of counters contains the same quantity, whether it is counted by ones or grouped and counted by tens and ones. It also assists them in developing the concept of one ten being the same as ten ones. At its most basic level, a treasure report involves counting a set by ones, grouping and counting the same set by tens and leftover ones, and drawing a picture to represent the tens and ones. As your students become more proficient, you can gradually integrate the additional skills of base ten, expanded form, rounding to the nearest ten, and counting by tens off a decade number. I have used this flexible activity in first and second grades, with a whole class working as partners in a general education setting and with a small resource group working as individuals in a special education setting. It would also be perfect as a math station. 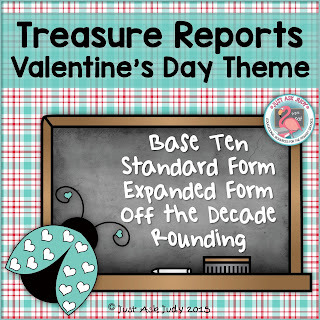 Treasure Reports: Valentine’s Day Theme is a free resource which includes five different recording sheets plus templates to print ten strips and ten frames. Grab this freebie in my Teachers Pay Teachers store. 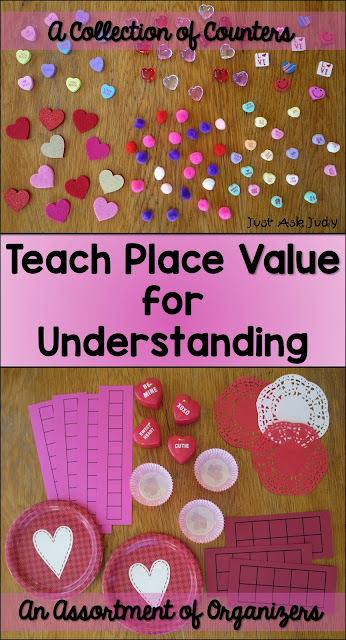 While you’re there, check out my Valentine’s Day and place value resources. I know, I know… it’s Monday but head on over to The Bender Bunch anyways to see the lovely collection of SPED-tacular Sunday Freebies!